Perdido Sun is your place in the sun. This raised first floor unit has stairs from the balcony which lead directly to the outdoor pool, indoor pool, hot tub and beach. So convenient especially with children. Electronics include 32" TV, DVD, CD Player in Living Room and a 20" TV, VCR in Master Bedroom. Excellent, very helpful , friendly, and courteous, had a great time!! The only need that I could ask for was a Keurig type coffee maker! 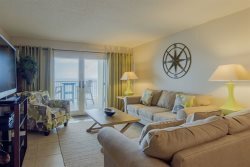 This is our 4th summer vacation staying at PERDIDO SUN. They have been the best at answering any of our questions & helping with our vacation needs. Thank you for all you've done for us. We will be coming back! This condo was fantastic! It was a well-equipped and very convenient to both the beach as well as restaurants and groceries. My family has been coming to Pensacola for years to visit with family and this was our first time ever renting a condo. It was a great experience! Thank you for a great vacation.